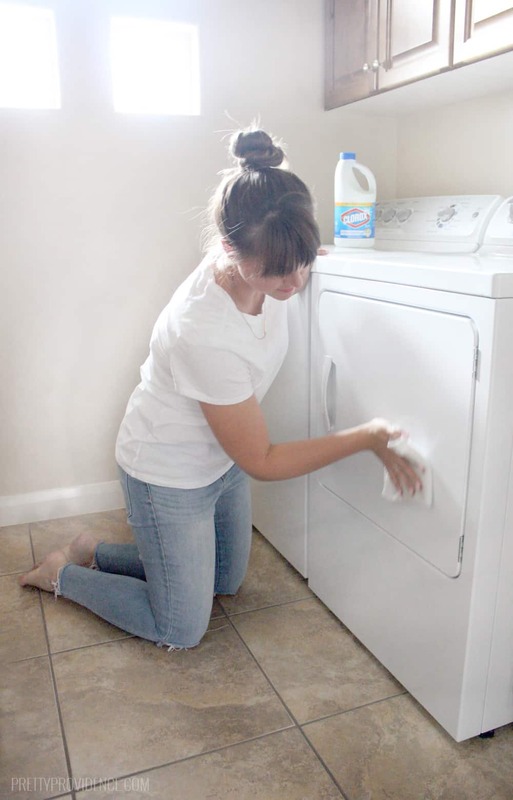 How to Clean Your Washing Machine - A Fast and Easy Way! YOU MAY HAVE WONDERED IF WASHING MACHINES NEEDED TO BE CLEANED OUT? WELL, THEY DO! GOOD NEWS IS CLEANING OUT YOUR WASHING MACHINE IS SUPER FAST AND EASY! If you follow us on instagram then you know that I’ve been having some laundry room drama the past few months! Long story short, I was without a dryer for almost 7 weeks! I will admit, doing laundry has never been my favorite chore. However, if you think doing laundry is bad, try being without your washer or dryer for a few weeks and I guarantee you will want to kiss them when they are back up and running! I know I did. With my new found gratitude for my working washing machine and dryer came an added desire to care for them properly. Did you know that washing machines need to be cleaned? It can seem strange to clean something that usually does the cleaning for you, but we clean our baths and showers right? Washing machines need to be cleaned as well! The good news is, cleaning your washing machine is super fast and easy! 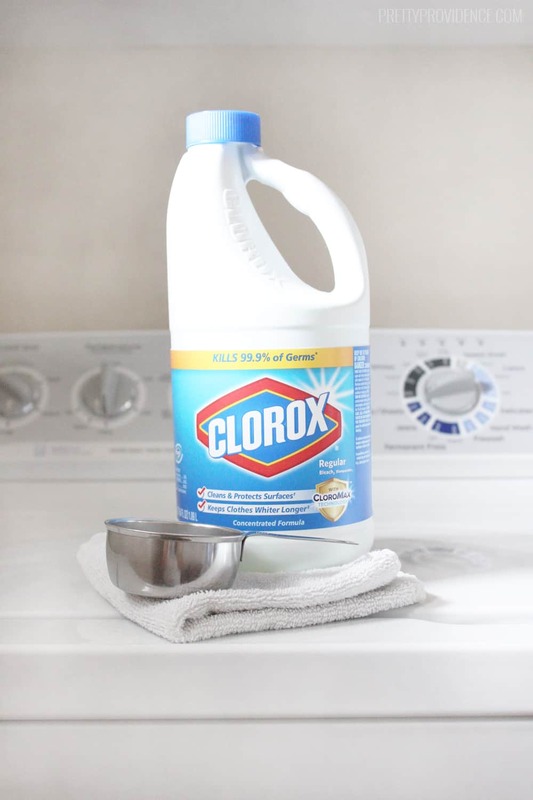 When I said cleaning out your washer, Clorox Regular-Bleach₂ with CLOROMAX® is the star of the show! In fact, it is all you need to get your washing looking good as new! Whether you have a top loader or a HE washing machine, they both need to be cleaned. 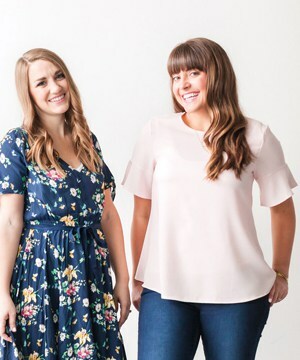 The method is basically the same, but the measurements differ a little! 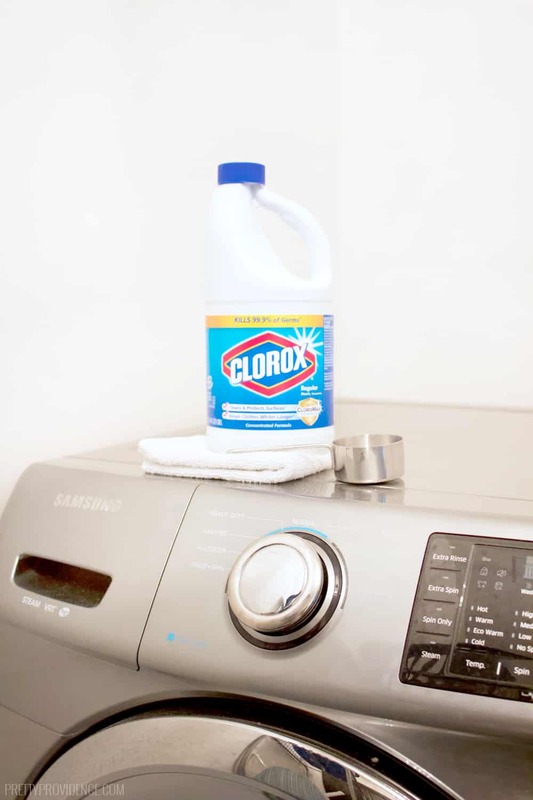 Add 2/3 cup of Clorox Regular-Bleach₂ with CLOROMAX® to the drum of your washer. Make sure your water setting is set to the hottest water, and run a regular load cycle. Make sure the drum has no clothes in it at the time of cleaning! Close the lid and let the cycle run its course. After the cycle is finished take a rag and wipe out the excess bleach water, and then use that rag to wipe down the exterior of your machine. Finally, I like to run my washer one more time on a “quick clean” or “rinse only” cycle just to make sure to remove all the bleach before my next load of laundry. Follow the same directions as above, except use only 1/3 cup of bleach and add bleach to the appropriate tray instead of dumping it straight into your drum! 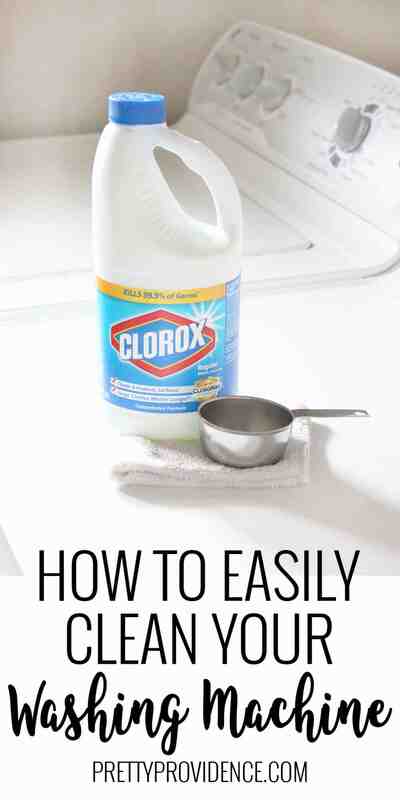 The great thing about using Clorox® bleach is that it cleans AND sanitizes simultaneously. As the load runs it breaks down any stubborn mineral deposits while also cleansing the drum of any mold or unpleasant smells and bacteria. It’s also nice because I always have some Clorox® on hand, since it is what I use to freshen all our white towels and sheets! If you need to grab some just run into your local Walmart and it is right in the cleaning section. Not to mention, it is so affordable! Well there you have it friends! Three cheers for clean, functional washer and dryers! CHECK OUT THESE OTHER AWESOME LAUNDRY RELATED POSTS! THANK YOU FOR SHARING THE USEFUL INFORMATION! THIS POST HAS GIVEN ME SO MUCH KNOWLEDGE AND HELPED ME SO MUCH WHEN CLEANING MY WASHING MACHINE. hey lady thank you for the great tip, I always knew I needed to clean uP inside my washer but never knew HOw. Your explanation was right on. Awe thanks Heather!! You are so sweet! Miss you! YIKES! I am embarassed to ADMIT THAT I HAVE NEVER CLEANED MY MACHINE! ADDING TO MY TO-DO LIST! Good thing it is SO easy to do or I would never get around to it! Haha. You read my mind! I opened the door to my laundry room this morning and was taken aback by the smell of the washing machine. I’ll be cleaning that bad boy out ASAP! OH MYY GOSH YES!!! I MEAN, WHEN I THINK ABOUT HOW DIRTY THE WASHING MACHINE HAS TO BE… IT TOTALLY grosses me out. Lol! Thank you for sharing this, because I wasn’t even sure where to start! Thanks for the reminder! Tume to clean my washer.